First of all, you can see that I now have a mouse. A Microsoft Bluetooth mouse. Cost about 1/3 of the cost of the tablet, but worth every cent. No need to jack into the single USB port, so no need for a hub. And it allows me to work at the higher-resolution level with the tablet - and therefore see more of my patches and desktop. Secondly, I've started doing *real work* with this system. It's going with me on the mini tour, but I'm not sure if it is going to be onstage yet. I'm hoping so, but I need it to do most of what I'm currently doing with the ESX-1. Part of what I'm doing is to make sure it works stably with my BeatStep. - This has a Realtek audio system, so <sigh>. ASIO4ALL seems like it should be a charm, but it only works at a real low latency setting - but the latency is actually very high. Using the WDM and/or MME drivers work best. - Turn off Wi-fi. People that are used to doing music with Windows boxes already know this - wi-fi interrupts in the worst, and most-often, way. - When working with software, watch out for bone-headed development. For example, I'd love to use the standalone version of the Image-Line DrumAxx software. The problem? Image-Line decided that they didn't have to do channel-limited MIDI, and the BeatStep puts everything out on a single MIDI line. 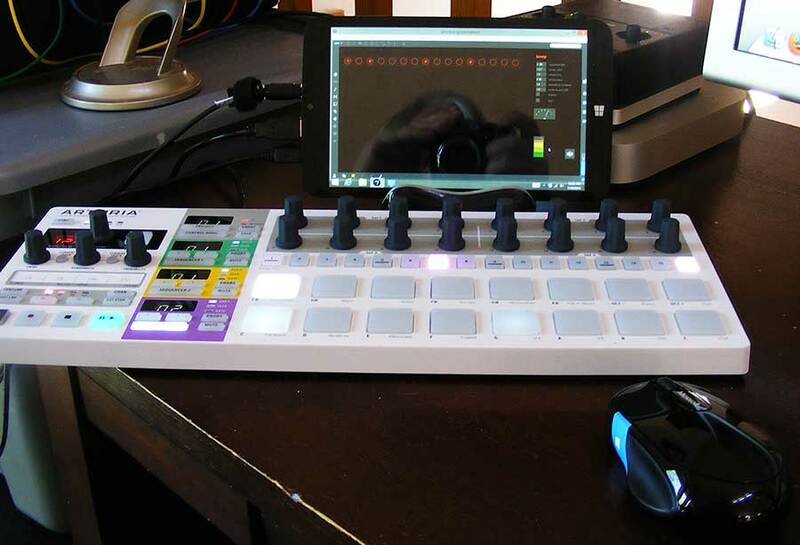 Hence, the DrumAxx plays the drum output - and both of the sequencer outputs, too. Makes it useless. You'd be surprised about how many software packages has some sort of chink in their armor. You could get around it by making some Max wrapper - but you probably don't want that extra overhead if you don't need it. There's a start! I'll let everyone know how it is going.